It’s spring, season of flowers and showers (except in California) so I’m sharing an excerpt from my sweet Regency romance. Short blurb: When a runaway heiress masquerades as a seamstress, she complicates the life of a tortured barrister who specializes in rescuing females in distress. Can he save her from a disaster of her own making or will the past repeat itself? In this excerpt, Stephen shows up at the dress shop on a rainy spring day with a basket of flowers. He handed her the basket of flowers, then shrugged out of his coat and handed it and his hat to Peggy O’Shea. She gave him a flirtatious smile in return before hanging the wet items on a nearby rack. “And paid far more than they were worth, I am certain,” Elinor murmured. “Did you say something, Mrs. Brown?” he asked with a raised brow. “Well, I am certain this will not be the last time,” he said gallantly. Ignoring Dolly’s worshipful look, he returned to the basket for another nosegay, white violets this time, which he gave to Peggy. With glad smiles for Mimi, and more thanks and curtsies for Stephen Chaplin, the girls donned their cloaks and left the shop. “Thank you,” Stephen Chaplin said. He delved into the basket one last time before handing it to Mimi. As she left the room, he handed Elinor a bunch of purple violets. Elinor held them to her nose and breathed in the sweet, delicate fragrance. “‘A violet in the youth of primary nature, forward, not permanent, sweet, not lasting,’” she quoted. “‘The perfume and suppliance of a minute; no more,’” he added softly. Startled, she gazed into his warm honey-brown eyes and her pulse began to race. She would have to guard her heart around this man? Why did he have to have such an effect on her? Was it simply because he was the only eligible gentleman she had ever known? No, a gentleman who brought flowers to poor shop girls and quoted Shakespeare was surely out of the ordinary. What a catch he would be for some young lady. But of course, not for her. 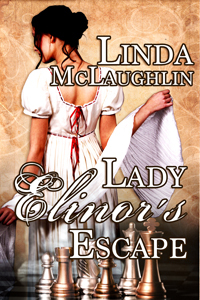 This entry was posted in General, Uncategorized and tagged #SpringflingRomance, excerpt, lady elinor's escape, Linda McLaughlin, Regency romance by Linda / Lyndi. Bookmark the permalink. Thank you for sharing the excerpt, Linda! Your novel was one of the most compelling, melt-the -heart Regency romances I’ve read lately. Thank you, Carmen. That’s so sweet. What a delightful SpringFling excerpt, Linda! I have your spotlight scheduled on my blog for 5/14/15. P.S. My spring flower is the Iris: tough and resilient, but elegant and beautiful. Thanks, Kim. I like iris, too. Very pretty flowers.